You'll love being associated with dolphins and their well-known intelligence and charisma as you tote this fun plush dolphin keychain with you. This cute little dolphin stuffed animal keychain is sure to delight with its soft turquoise fur, light blue tummy, and sweet face. 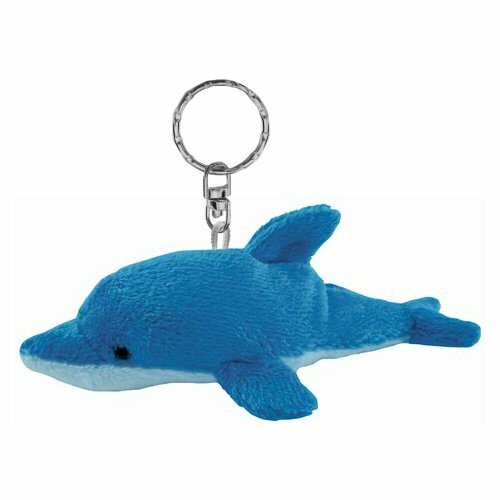 This dolphin plush keychain is the perfect take-along pal and is excited to travel with you on your adventures, be it on your key ring, belt loop, backpack, purse, or even looped around your finger. Fun Facts about Dolphins: Did you know that the famous dolphin in the Flipper TV series was actually a girl? It's true! Her name was Mitzi. However, it was stunt dolphin Mr. Gipper who did the tail-walking for her.